At this point I come across a boundary, and a kind of uninhabited zone between known territories. Behind me is the literature I have been calling experimental writing on art, and even farther behind, there is art history. Ahead, the writing includes images but is not necessarily about art. What does the land ahead look like? In the summer 2013 issue of Frieze, the novelist Ben Lerner speculated on the relation between novels and visual art. He mentions Thomas Bernhard's Old Masters, Javier Marías's A Heart so White, Proust's passage on the yellow wall in Vermeer's View of Delft, John Ashbery's Self-Portrait in a Convex Mirror, and Tim Clark's Sight of Death, which he says "has as much in common with novels as it does with most conventional art criticism." (That is an unsatisfying thing to say without qualification, because it could mean Clark's book is like a novel, or that it's unlike either novels or criticism.) All of Lerner's examples, except Clark, are fiction or poetry that address actual works of visual art. His own book 10:04, which appeared in 2014, briefly mentions several actual artworks. I'll be discussing several of the books Lerner mentions, including his own, in the next part of this project. Lerner then concludes that even though "Clark is rigorously involved with two real canvases,"
This conflates two possibilities that I think it's important to separate. On the one hand, fiction can address works of art that don't exist, and on the other, fiction can address works that do exist, or have existed, but it can propose "staged" encounters and narratives around those works. Let me number these in order to keep track of some ramifying possibilities. Within the second category, fiction that stages encounters about actual artworks, there is an apparently small but important distinction to be made between (2a) writing that can be said to address a work of art, like Ashbery's poem, and (2b) fiction that happens to include art among many other interests. In category (2a), part of the writer's purpose is to say something about the artworks, and that brings it, distantly but distinctly, into the domain of this project. This category includes any number of ekphrases from ancient examples to the present. Writing poems about artworks is to some degree a modernist custom. Ashbery, Auden, and many poets have written novels, stories, and poems that address artworks. The critic Raphael Rubenstein curated poems on contemporary artworks in the summer 2013 Art in America, and he has written some himself. Several important works of modernist fiction treat actual artworks extensively, such as Peter Weiss's Aesthetics of Resistance, and there are also contemporary and popular fictions that turn on real artworks, from Donna Tartt's The Goldfinch to Dan Brown's books. On the other hand, Proust's novel is certainly in category (2b), because it's only in the world of art history that the "yellow wall" in Vermeer's View of Delft looms so large. When a long novel like Proust's stops briefly to evoke a painting, then the novel isn't about the painting: the painting is a vanishingly small point, a moment of the Real, in a larger fiction. But (2a) remains an interesting possibility. There are works of fiction in which some measurable part of the author's interest is the evocation of artworks that readers know, or could so and see. It is tempting, in the context of this project, to see what happens if such texts are read as if they are "experimental writing on art": as if fiction was partly, or even principally, a strategy to say more about the art than would be possible in the constraints of nonfiction. I'll consider two examples: the first, a novel by Don DeLillo, goes to show how hard it can be to say exactly what's gained by descriptions of artworks in fiction. The second, Proust's In Search of Lost Time, indicates the complexity of trying to unweave descriptions of artworks from their fictional meshes. DeLillo's novel begins and ends with descriptions of what it's like to see Douglas Gordon's 24 Hour Psycho, a version of Hitchcock's movie slowed down so it takes a full day. At that rate, individual frames (usually invisible at 24 frames per second) appear as softly blurred individual images. Several excerpts on Youtube demonstrate that. It would be perverse to read Point Omega as an attempt to say things about 24 Hour Psycho that cannot be accommodated by art history, theory, or criticism, but if I was to read it that way, I might be able to distinguish descriptions that could occur in nonfiction from other passages that could only happen in fiction. For example, the book opens with a straightforward description of the screening room at MoMA in 2006, told with a third-person narrator. (Most of the book uses a first-person narrator, but this character is different; he is effectively first-person, but is given in focalized third-person to distinguish him from the book's principal narrator.) DeLillo tells us about the screen, the guard, and the ways people move around the room. That sort of introductory material could be part of art criticism, although a typical newspaper account wouldn't be able to accommodate it. In a few pages, the narrator's descriptions become more exact, and some of his observations wouldn't be out of place in a film theory essay. He notes, for example, that "Anthony Perkins turns his head in five incremental movements," and that he notices how the shower rings in the famous scene vibrate up and down (pp. 5, 9). These passages couldn't happen in academic film theory, criticism, or history, if only because they report on theories that are not themselves explained: they're about an awareness of theories, but they don't serve to articulate those theories. This is a simple and clear example of a way to talk about 24 Hour Psycho that would not be available in nonfiction. This is even more obviously not plausibly a part of academic writing, because it is a critique of such writing. The ideas DeLillo's narrator gives voice to could be analyzed, and then they might well appear in an academic context, but the passage itself is a criticism, made in a voice that's incrementally close to the author's. The opening and closing chapters of Point Omega are the only ones devoted to describing the experience of viewing 24 Hour Psycho. But the body of the novel is full of parallels to the film, and each one of them can be understood, in the perverse reading I am entertaining here, as a way of saying something about Gordon's film that could not be said either in nonfiction or in the straightforward and careful descriptions in the opening and closing chapters. First, there are several films mentioned in Point Omega: some real, like Sokurov's Russian Ark, and others invented, like the first-person narrator's own film about Jerry Lewis (pp. 22, 25-7). There are also echoes of specific scenes in Hitchcock's film, for example a memory one character has of a janitor who walked down stairs backwards; that echoes the detective's fall down the stairs in Hitchcock's film (pp. 32, 37, and compare the escalator described on p. 41). Those parallels exhibit a freedom not available to writers who write only nonfiction, but it isn't obvious exactly what they contribute--and part of the reason it isn't obvious is that I am constrained by my reading to search for passages that enrich our understanding of Gordon's film, rather than passages that contribute to the novel's themes of eternity and the "omega point." More interesting are the extended parallels between 24 Hour Psycho and the dilated time the narrator, his host, and his host's daughter spend in a small house in the desert, setting for the main part of the book. The narrator's host, Elster, has ideas about eternity and infinity that work as hyperbolic extensions of the twenty-four hours of Gordon's film. He contrasts time in the desert, and especially the suspended time that he experiences after his daughter vanishes, against the time of cities, "dimwit time, inferior time, people checking watches and other devices" (p. 45). Elster visited the installation of Gordon's film in MoMA, and it reminded him of even vaster time scales. "We're the last billionth of a second in the evolution of matter," he says. For him, the film was "like watching the universe die over a period of about seven billion years" (pp. 50, 47). Point Omega is about "deep time, epochal time," and Teilhard de Chardin's concept of the "omega point," the convergence of all creation onto unity, which Elster interprets in a secular sense as the time when time will slow to a stop and people will become material: stone, desert, sky (pp. 52, 72, 98). Things get complex from here, because even though DeLillo's theme is clear (he has Elster say it several different times, and the book's penultimate chapter, when Elster's daughter has gone, plays out the timelessness of "point omega"), the novel's many partial parallels and slant rhymes with 24 Hour Psycho make it difficult to say how the meaning of that film might be enriched by the novel, except in the trivial sense that the film elicited thoughts about deep time. I'll just give one example of that fairly unencompassable complexity. It's a complex analogy, and I cannot quite put into words how, or even if, it contributes to my appreciation of 24 Hour Psycho. So at this point it might be best to give up my reading, but the question remains: fiction definitely does sometimes add to our understanding of artworks, but as far as I know the mechanisms by which that happens, and the special resources fiction may provide, remain untheorized. Proust makes many sorts of references to visual experience, visual memories, and artworks real and invented. Because there are no images in the novel, it is outside the current project: but it remains a central instance of the representation of the visual in modernist fiction. The principal question here is what counts as the visual in Proust, both in relation to his theories of memory, and more literally in relation to his interest in a actual paintings and architecture. I think on the whole Proust is far less accessible than he has been taken to be by critics who imagine he describes artworks. I will consider the place of the visual in the novel from two perspectives: first, the question of what sort of visual references tie the novel to actual artworks; and second, the curious problem regarding what, in Proust's mind, works as evocation of the visual. driblets of sun," seems especially painterly. ("Proust's Combray Church: Illiers or Vermeer?," Proceedings of the American Philosophical Society 112, 1968, pp. 5-7.) This possibility makes the memory that much more complex, especially if it is read alongside Benjamin Binstock's plausible suggestion that Proust was not looking carefully at the painting (or rather, a reproduction of it) when he came to actually describe it later in the novel. If something of both these observations are true, it becomes interesting to contemplate what counts as ekphrasis, or as a relation to facts in the world. Within the novel's logic, there are "inner" and "outer" kinds of experience while reading (I.115-20), partial and more complete memories (many, like the madeleine memory, not completely explained for hundreds of pages), voluntary and involuntary memories, and the continuous reminder, from the narrator to himself, that the real issues are in his own mind, not in the world. (This is repeated nearly as a mantra, perhaps five times in the first hundred pages.) 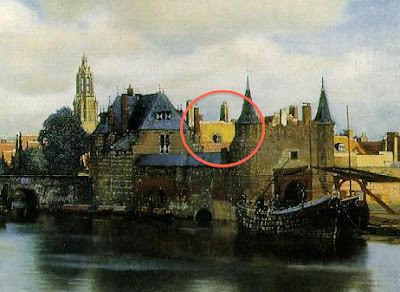 The fictional town Combray may be fused with the reproduction of a painting, and the reproduction fused with other unspecified memories, so that the novel never reaches out of itself, and cannot be properly said to attach itself to visual objects, like Vermeer's painting, which exist in the world for others to see. There are many counterexamples--first among them Giotto's Arena Chapel, where realism is exactly what is at stake, even though it is pointedly not the realism of a naturalistic painter--but the ones that matter are entangled in the text, embedded (in a Proustian metaphor) in the novel's inner life. Often, however, the hidden meaning isn't a childhood experience or other instance of "lost time," but the expression of the search itself in writing. The entire interest of the visual in the novel can even be imagined, without much distortion of the narrator's intent, as a problem in writing. In I.256 for example, he resolves the deeper meaning of the three steeples not by discovering something new, but by writing about them; and the passage he presents us, which he says was written on the spot, hardly offers anything different from the initial description that precedes it in the novel. It's possible to put this even more strongly, or literally. Visual memories are of interest often, and perhaps ultimately, because they can be enchained, linked in clauses and sentences to thoughts that Proust's narrator calls "philosophic," and which often involve other senses. An example among many is I.238, where a sharply visual description of a lily, pushed back and forth by the current of the Vivonne river, reminds the narrator of "certain victims of neurasthenia" who exhibit what we would call repetition compulsion, and then of "those wretches" in the Inferno who repeat their torments indefinitely. The point on which this sentence rests--and the point of the sentence--is the unexpected turn, at the end, where the thought of Virgil hurrying Dante past the damned reminds the narrator that his parents want him to catch up to them on their walk. The purpose of visual description, here and in general in the book, is to facilitate, introduce, or initially ground and focus enchained ruminations that move away from the visual and on into other senses, metaphors, allusions, and finally into unexpected insights. The visual is in other words reimagined as writing. I hope these two inadequate analyses suggest how much more there is to be said. I don't disbelieve in the perverse attempt to read a novel, like DeLillo's, to see what it might be saying about an artwork: but I can't see how to proceed with the analysis. And I don't think Proust's special kind of imbricated complexities of memory and invention are a model for interpreting other people's fictions about actual artworks: but I am not sure how Proust's novel differs from others fictions in that regard. It's a fascinating topic, one that is not well served by the simple observation that novels sometimes contribute to our sense of the complexity of actual artworks.